Sabah Housing and Real Estate Developers Association (SHAREDA), formerly known as Sabah Housing Developers' Association (SHDA) was established in 1978 primarily as an association of housing developers. It was reorganised in 2002 to encompass property development as a whole, including housing. SHAREDA brings together developers who have enlisted as members to pool their expertise and resources to ensure that the industry plays its full part as a prime mover of the economy. Over the years, SHAREDA members have sat on numerous regulatory government committees and helped to shape many government policies and guidelines affecting real estate and housing development in Sabah. SHAREDA's exemplary performance and its active role in promoting the industry was recognised on 22nd May, 2010 when the Association was chosen from more than 5,000 societies registered in Sabah to receive the prestigious "SABAH SOCIETIES' ROLE MODEL" (Anugerah Pertubuhan Contoh) Inaugural Award by the Registrar of Societies Malaysia. The award speaks well of an Association that started with 15 members in 1978 and has grown to 182 members in a little over three decades. The Association has been fortunate to have dedicated and quality leadership from the moment it was formed. Datuk William C. V. Fong was one of the founding members and served as the founding Chairman (1978-1981) of the Association. Others who served as Chairmen/Presidents were the late Tan Sri Datuk Seri Panglima Wong Chik Lim (1981-1985), Datuk Yap Pak Leong (1985-1989), Datuk Yong Loi Thiam (1993-2001), Datuk Haji Abu Bakar M. Yahya (2001-2005), Datuk Kong Kwok Wah, JP (2005-2009), Datuk Susan Wong Siew Guen (2009-2013) and Francis Goh Fah Shun took over the helm from 2013-2015 as the newly elected President at the 20th Annual General Meeting held on 27th March 2013. 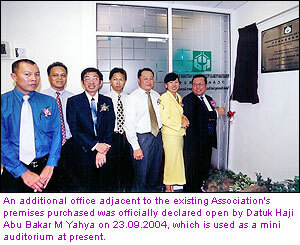 To mark its 20th Anniversary in 1998, SHAREDA acquired its own premises at Beverly Hills Plaza, Kota Kinabalu. Then on 27th March, 2002, the SHAREDA Secretariat was established and became operational. Gradually, the Association's Secretariat office was extended and renovated when the three (3) adjoining lots to its office were acquired in 2004, 2007 and 2012, respectively making up a total area of about 3,546 sq. ft. Presently, the Secretariat Office is fully equipped with office automation and facilities including a mini auditorium with a sitting capacity of about 100 persons, a small conference room, filing room, storeroom, and president office in addition to the workplace. Congratulations to all the above recipients for the awards! In the above endeavours, the Malaysian Developers' Council (MDC) was formed on 12th May 1996, formerly known as "Tripartite" comprised of Real Estate and Housing Developers' Association (REHDA) Malaysia, Sarawak Housing And Real Estate Developers' Association (SHEDA) and SHAREDA. The main objective of the Council is to provide a forum for consultation on issues affecting the housing industry in the country and to foster closer relationship amongst the 3 Associations. Each Association takes turns to host the MDC meeting once a year, subsequently changed to twice yearly from 2007 to dialogue on industry issues and jointly address problems. 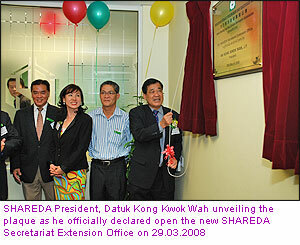 SHAREDA, in collaboration with the New Sabah Times, facilitated the launching of a weekly property column on 11th February, 2002 to provide an avenue to members to feature their housing and development projects and also to provide write-up on matters related to the housing industry were published until today. The SHAREDA Editorial and Publication Committee has published Bulletins, Articles and Circulars to be disseminated to members and interest-groups and encourage participation by members to contribute ideas and proposals for position papers that can help to enhance the Association's performance as well as that of the industry. With the success achieved by SHAREDA so far and with the commitment demonstrated and co-operation offered by the members there is no doubt that the Association will progress further and continue to make meaningful contributions towards the growth of the Country.